Abraham Rubin Hercules Benrubi (born October 4, 1969) is an American character actor known for his appearances as Jerry Markovic on the long-running U.S. TV drama ER, for his first role as Larry Kubiac on the series Parker Lewis Can't Lose, Dennis in Without a Paddle, and for his voice acting on the Adult Swim claymation series Robot Chicken. Abraham Benrubi at a 2012 NASA Social to preview the landing of the Curiosity rover. Benrubi was born in Indianapolis, Indiana, the eldest son of Patricia and Asher Benrubi, who was a rock singer and is currently a radio personality known as "Smash" to St. Louis radio audiences. His paternal grandfather was from a Greek Jewish family. His paternal grandmother, who was born to a Greek Orthodox Christian family, helped shelter Jews in Greece during World War II and later converted to Judaism. 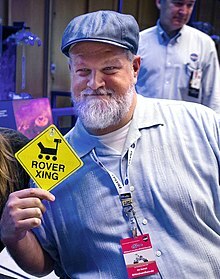 Benrubi graduated from Broad Ripple High School in Indianapolis, the same high school alma mater of David Letterman and former New England Patriots star Rosevelt Colvin. Benrubi's first major role was on the show Wings, as Roy "R.J." Biggins, Jr., Roy's gay son. He would appear as R.J. twice: once during the show's second season, and again during the seventh season, shortly after he began working on NBC's ER. Benrubi starred as one of the main characters in ABC's show Men in Trees, playing bartender/millionaire Ben Tomasson. This was a role where he got noticeably more main dialog and depth than with his previous longtime characters on ER and Parker Lewis Can't Lose, which primarily consisted of supporting dialog. Ben Tomasson was described as "the cuddliest TV character since Jorge Garcia's Hurley on Lost" by TV-critic David Bianculli. Other previous work includes playing Mose in the 2003 western Open Range, a role the actor won because he had been cut out of director Kevin Costner's previous film, The Postman. He frequently voices characters on Adult Swim's stop-motion animation show Robot Chicken, and has also contributed to a second show from Chicken's creators, Titan Maximum. Following the cancellation of Men In Trees in early 2007, Benrubi returned to the cast of ER in late 2008 for the show's final season. Benrubi played a young Dan Conner, the character portrayed by John Goodman, in a flashback episode of Roseanne. Benrubi starred in the short lived (April 2010 to June 2010) ABC show, Happy Town where he played the part of Big Dave Duncan. Almost right after the series's cancellation was announced he appeared in a new show Memphis Beat, where he plays the part of police Sgt. Jody "JC" Lightfoot, a desk sergeant that is 1/16 Chickasaw by a distant relative, but chooses to embrace Native American culture all the same. In May 2011 it was announced that he would star in Glutton, a "3D psychological thriller" directed by David Arquette. Benrubi will play Jethro, a 1,200-pound man, forced to save his sister's life. Jethro's sister is played by Patricia Arquette, while Kacey Barnfield also stars as his blind neighbour and only friend. Benrubi is a member of Los Angeles' Sacred Fools Theater Company. Wings as Roy "R. J." Biggins, Jr.
^ Abraham Benrubi Biography (1969–). Filmreference.com (1969-10-04). Retrieved on 2012-05-05. ^ Rachel Benrubi, 86; family hid Jews in Greece during WWII – St. Louis Jewish Light: Obituaries – Rachel Benrubi, 86; family hid Jews in Greece during WWII: Obituaries. Stljewishlight.com. Retrieved on 2012-05-05. ^ Kelly, Robert. (2009-04-20) Those who aided Jews honored Many put their lives at stake to conceal Jews from Nazis during Holocaust. COMMMERATION. Stltoday.com. Retrieved on 2012-05-05. ^ TNT – We Know Drama. Tnt.tv. Retrieved on 2012-05-05.